Ring 07551388380 for more information or book your place at Eventbrite. Can our deepest questions about life really be answered through meditation? 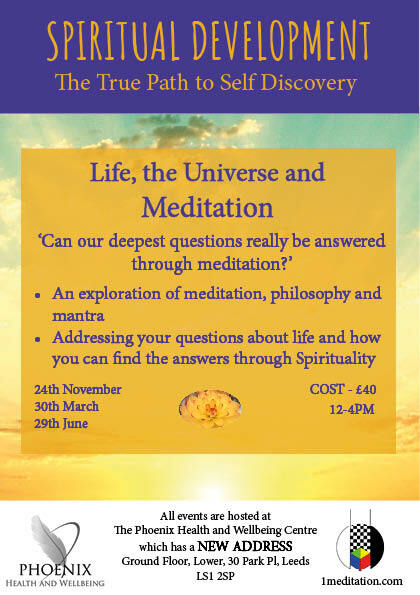 A practical workshop exploring a deeper enquiry into life through the expanded states of awareness found in meditation. Come along, unwind – learn to relax deeply, enjoy new techniques and a few hours in the company of like-minded people. A great way to rejuvenate and inspire yourself, whatever your current experience of meditation. Imagine a state of total freedom. It cannot be described in words – you must become it. Access deep stillness, peace and relaxation through the exploration of meditation. Meditation, Philosophy and Mantra can help you gain insights into yourself and the World. Come along, unwind – learn to relax deeply, and enjoy new techniques and a few hours in the company of like-minded people. A great way to rejuvenate yourself, whatever your current experience of meditation. Learn powerful meditation techniques for helping self-development. Experience different meditation techniques as you learn to increase your awareness inside. Experience guided meditations, breath meditation, focus meditations. Address your biggest questions about life and the Universe and discover how you can find the answers for yourself. After this workshop participants will have the necessary tools & meditation support to continue a regular practise of meditation.